Postgraduate Medical Education (PME) in Nigeria: Past, Present and Future was a solicited paper delivered at the Annual Scientific Conference of Society of Obstetrics and Gynaecology of Nigeria held in Abuja in November 2015 in honour of Professor L. N. Ajabor, the doyen of medical practice and a foremost practitioner and researcher in Obstetrics and Gynaecology whose several achievements and influences on professional practice in undergraduate and postgraduate medical education span over 40 years within and outside Nigeria. This lecture was a befitting tribute to a hero, mentor and benefactor, who with several of his colleagues championed the development and implementation of PME in Nigeria in the 70s, the assessment undertaken in this paper suggests that while the main purpose of PME have largely being achieved in Nigeria, a lot remains to be done in propelling it beyond its original vision to enable it compare favourably with similar medical post graduate training in other parts of the world. This lecture is organized in four main areas: Professor Linus Ajabor autobiography, The history, origin and intention of postgraduate medical training from the international perspectives, the history of postgraduate medical education in Nigeria, status of residency training in Nigeria, challenges facing medical education in Nigeria. The PhD versus fellowship controversy in Nigeria and the future of postgraduate medical education in Nigeria. Professor Linus N. Ajabor, a quintessential medical doctor, a role model and mentor extra-ordinary, graduated in Medicine from the University of Bristol in 1960 and subsequently became a member of the Royal College of Obstetricians and Gynaecologists, Fellow of the West African College of Surgeons, National Postgraduate Medical College of Nigeria, and International College of Surgeons. As Head, Department of Obstetrics and Gynaecology at the University of Benin he trained and motivated several generations of Nigerian doctors and specialists and developed the Department into a foremost Department of Obstetrics and Gynaecology in Nigeria. He mentored several generations of Consultants and Professors after training, and his mentees include more than 30 Professors. He is a recipient of several prestigious awards including the Order of the Niger (OON) by the Federal Government of Nigeria. As President of the Society of Gynaecology and Obstetrics (SOGON) between 1999 and 2002, he brought great visibility to the society and received SOGON special Golden Jubilee Award in 2015. It is this patriotic and visionary Nigerian, a foremost practitioner and researcher in Obstetrics and Gynecology, a role model and mentor extraordinary, that His Mentees under the Forum “Series on Frontiers in Medical Education” have decided to honor him with the inaugural lecture on medical education in Nigeria. I am extremely delighted to be invited to deliver this epoch-making and foundational lecture. This lecture is organized in four main sections: (1) the history and intentions of postgraduate medical education (PME), (2) the history of PME in Nigeria, (3) the challenges facing PME in Nigeria. I will briefly give opinions on the Fellowship versus PhD controversy and conclude with recommendations. Professor Linus N. Ajabor is a man of many parts – a quintessential medical doctor, a role model and mentor extra-ordinary, and a superb service delivery expert. He is presently the Chief Medical Director and Consultant Obstetrician and Gynaecologist at the Anita Summit Hospital and Centre for Reproductive Medicine and Infertility, in Benin City, Edo State, Nigeria. He graduated in Medicine from the University of Bristol, United Kingdom in 1960 and completed internship training at the United Bristol, Southmead, and Frenchay Hospitals, Bristol and Weston-Super-Mare Hospital Groups in the United Kingdom. He subsequently undertook postgraduate training and became a member of the Royal College of Obstetricians and Gynaecologists in 1966. He obtained a diploma in advanced techniques in the management of fertility in the USA in 1975. Professor Linus Ajabor is a Fellow of the West African College of Surgeons, a Fellow of the National Postgraduate Medical College of Nigeria, a Fellow of the International College of Surgeons, and a Fellow of the Royal College of Obstetricians and Gynaecologists. Between 1966 and 1968, he served as a researcher and Consultant Obstetrician and Gynaecologist in various hospitals around the world including the University of Ibadan; University of California in San Diego, USA; Washington University, St. Louis, Missouri, USA; the University of Birmingham, England; and the University of Benin, Benin City, Nigeria. He was appointed as a Professor of Obstetrics and Gynaecology at the University of Benin in 1976. He served as the Head, Department of Obstetrics and Gynaecology at the University of Benin between 1975 and 1980, during which he also served as the Director of various fertility-related research projects in the University and its Teaching Hospital in collaboration with Pathfinder Fund, USA and other international funding agencies. As the Head of Department, Professor Ajabor trained and motivated several generations of Nigerian doctors and specialists and strongly developed the Department at the University of Benin Teaching Hospital to become a foremost Department of Obstetrics and Gynaecology in Nigeria. He was one of the early teachers and examiners in the Faculties of Obstetrics and Gynaecology of the National Postgraduate Medical College of Nigeria, and the West African College of Surgeons. This provided him the opportunity to firmly entrench the ethical and scientific principles of the practice of clinical Obstetrics and Gynecology in national consciousness. It was at this time that his name became a household word among young medical doctors seeking to take up the speciality of Obstetrics and Gynaecology in Nigeria. His service delivery niche attained a second international ascendancy when he was appointed the first substantive Chief of Obstetrics and Gynaecology at the Prince Abdullah Bin Abdul-Aziz Hospital, Bisha, Kingdom of Saudi Arabia between 1990 and 1993. In this hospital, he developed and administered a very busy department and established a continuing medical education postgraduate training programme leading to the awards of the United Kingdom and Saudi Arabian specialty board diplomates to international trainees. Professor Ajabor is a keen researcher who has contributed immensely to providing a better understanding of the peculiar nature of obstetrics and gynaecology within the context of sub-Saharan Africa. However, it is in training and teaching of undergraduate and postgraduate medical students that he has made his most phenomenal mark and stamped his imprints in the sands of time. A young medical student at the Igbinedion University, Okada (where Professor Ajabor has taught students over the past 10 years) remarked in January 2015 that “If Professor Ajabor teaches you obstetrics and gynaecology, and you still do not know the subject, then it means that you will never know obstetrics and gynaecology. He seems to have the ability to open the brains of students and to put the subject in them." To date, Professor Ajabor has taught several generations of Nigerian doctors either as medical students, House Officers, or postgraduate residents in diverse fields. Even after training, he continues to provide immense support and advice to several generations of Consultants and Professors at their various places of service delivery and leadership. Indeed, his role as a mentor has remained unsurpassed in Nigeria, which has now enabled him to gain the epithet “the Oracle of Oregbeni” among his most ardent apostles and admirers. His mentees include more than 30 Professors who have served and are still serving in various hospitals in Obstetrics and Gynaecology and in other fields of social development in Nigeria. Some of these include eminent doctors and specialists including the former Governor of Rivers State, His Excellency, Dr Peter Odili, Professor OA Ladipo, Professor JA Adeleye, Professor G Iloabachie, Professor Hogan Itam, Professor Polite Onwufua, Professor M Ezimokhai, Professor FME Diejomaoh, Professor Eugene Okpere, Professor J Ikimalo, ProfessorPFeyi-Waboso, Professor LI Ojogwu, Professor M Momoh, Professor JA Otubu, Professor Friday Okonofua, and Professor Biodun Ilesanmi, among several others. Professor Ajabor is a recipient of several prestigious awards including the Rockefeller Postdoctoral Research Fellowship, Rotary International Award for excellent service delivery, the Distinguished Services Award of SOGON, the prestigious Rotary Foundation Meritorious Award, the Honorary Doctorate Degree of Science of the International Biographic Center, and the prestigious Award of the Officer of the Order of the Niger (OON) by the Federal Government of Nigeria. He was the President of the Society of Gynaecology and Obstetrics (SOGON) between 1999 and 2002. As President, he brought great visibility to the society which enabled SOGON to obtain grants from several international organizations such as FIGO and the MacArthur Foundation. It is, therefore, not surprising that SOGON as part of its 50th year Anniversary celebration in November 2015 has nominated Professor Linus Ajabor to receive its special Golden Jubilee Award. In the letter nominating him for the Award, the President of SOGON, Professor Brian Adinma mentioned the sustained contribution and consistency of Prof Ajabor in supporting SOGON's activities as reason for the Award. In 2008, the University of Benin Teaching Hospital named one of its Maternity Wards “the Professor Linus Ajabor Ward” in recognition of the immense contribution he made to the development of the hospital. Professor LN Ajabor is married to his lovely and amiable wife, Mrs Christiana Aba Ajabor and they are blessed with children. It is this patriotic and visionary Nigerian, a foremost practitioner and researcher in Obstetrics and Gynecology, a role model and mentor extraordinary, that His Mentees under the Forum “Series on Frontiers in Medical Education” have decided to honor with the inaugural lecture on medical education in Nigeria. I am extremely delighted to be invited by the Sponsors of the Frontiers on Medical Education (FME) to deliver this maiden lecture in honour of our revered icon, Professor Linus Nwachukwu Ajabor JP, FRCOG, OON, Hon DSc on this special occasion of the 50th Anniversary Celebration of the Society of Gynaecology and Obstetrics of Nigeria (SOGON). Being asked to deliver this lecture by this noble group is not only an honour but a rare privilege as I am aware that there are many qualified professors among its rank who can equally deliver the lecture. Indeed, when Professor FME Diejomoah first called me and started a long conversation on the lecture, I wanted to stop him at some point to ask why I was not being invited, being an academic son of Professor Ajabor, to be a sponsor and member of the FME. However, I stopped when he rapidly moved on to invite me to be the first guest speaker, as I immediately reasoned that this is an all-time privilege which could be jettisoned if I was to be a foundation member of the group. So, I decided to seize this opportunity and wait for another day to join this well intentioned group whose members are all protégés of our highly respected Professor LN Ajabor. I am indeed, very grateful to Professor FME Diejomoah and Professor M Ezimokhai, the prime movers of the FME for inviting me to deliver this epoch-making and foundational lecture. Professor Linus Nwachukwu Ajabor is today one of Africa's most highly respected living legends in obstetrics and gynaecology; a role model and mentor extraordinary of several generations of Nigerian teachers, professors and practitioners; a disciplinarian with a kind heart, who continues to promote and champion the ethical practice of obstetrics and gynaecology; a medical visionary who is forcefully passionate about his beliefs; and a leading disciple and guardian of postgraduate medical education (PME) in Nigeria. I would say without any fear of contradiction that Professor LN Ajabor is one of the very best that the profession of obstetrics and gynaecology has offered to the Nigerian people in efforts to promote women's health and social well-being. In a career spanning over 54 years of medical practice in Nigeria, United Kingdom, USA, and Saudi Arabia, he distinguished himself as a trainer and teacher, a tutor and adviser of professors, and a high profile researcher whose research findings first provided insights into the peculiar nature of obstetrics and gynaecological practice in Nigeria. Professor LN Ajabor was the President of SOGON from 1999 to 2002. As President, he provided a new direction for SOGON, and strongly positioned our society to become a major player in social philanthropy at both the national and international levels. Today, SOGON has continued to enjoy the benefits and legacies so elegantly left behind during the Presidency of Professor Linus Ajabor. Of all his many accolades, it is in medical education and mentorship that Professor Ajabor excelled and is leaving an indelible mark. At this point, I must reveal that my choice of obstetrics and gynaecology as a postgraduate discipline was largely influenced by Professor LN Ajabor. I served as his House Officer at the University of Benin Teaching Hospital (UBTH) between 1978 and 1979. At that point, I was torn in my career choice between my experiences with different mentors in different disciplines. These included Professor Sheila Kenny (Professor of Anaesthesia in Dublin), who had offered me a place in Scotland to study anaesthesia; Professor Jackson Omene (who was vehement that I should specialise in paediatrics); Professor Uchenna Nwosu (an erudite professor of obstetrics and gynaecology who taught me the scientific principles of the discipline as an undergraduate student in Ife); Professor Anah (a physician who impressed me greatly when I worked under him as a House Officer at the UBTH); and Professor JJ Andy, who till this day is still stupefied that I failed to study internal medicine despite his proclamation when I was a student under him that I was naturally a physician. My final choice of obstetrics and gynaecology rested principally on the influence of two persons – Professor Uchenna Nwosu and Professor Linus Ajabor: Professor Uchenna Nwosu for his focus on teaching obstetrics and gynaecology from primary scientific principles that widely opened my vistas to the discipline, and Professor Linus Ajabor for his didactic clinical teaching and focus on skills acquisition, professional discipline and ethical practice. Clearly, Professor LN Ajabor is best described as the doyen of medical practice whose several achievements and influences on professional practice cannot be summarized in a short lecture of this nature. The choice of FME as theme of this lecture series and of Professor Linus Ajabor as the focus of the first lecture is therefore most appropriate and timely. This lecture titled “Postgraduate Medical Education in Nigeria: Past, Present, and Future” is organized in four main sections. In the first section, the history, origin, and intentions of postgraduate medical training will be described from the international perspective. In the second section of the paper, I will discuss the history of PME in Nigeria and how this has developed over time. The third section of the paper will focus on elucidating the challenges facing PME in Nigeria. In this section, I will do a comparative analysis with postgraduate education in other parts of the world. In the final section, we will conclude by making substantive recommendations on ways to improve postgraduate medical training in Nigeria. By PME, we mean the constellation of learning activities carried out to enable doctors develop relevant competencies and deeper knowledge in specific subject areas after completion of basic medical education. PME, as described in this paper, includes pre-registration training, vocational/professional training, specialist, and sub-specialist training as well as other forms of training obtained after the initial undergraduate medical education. The purpose of medical education is to improve the health of all people and to develop new knowledge and innovations for high-level medical practice. Therefore, our definition also includes Masters and PhD training undertaken by medically qualified doctors in fields such as the basic medical sciences, public health, health economics, and other disciplines. Indeed, the new mantra in PME is for medical graduates to obtain skills for high quality multidisciplinary research and experimentation needed to make ground-breaking discoveries in various specialist and sub-specialist areas. The importance of mainstream postgraduate training for the medically trained professional in the new millennium can therefore not be overemphasized. PME includes both further theoretical education and intense clinical and practical training. In addition, the ability to conceptualize and implement research and to report relevant research findings in a concise, evidence-based, and acceptable manner so that such research can be reproduced elsewhere is an important goal of PME. PME is a life-long continuum of training which includes supervised residency training (RT), continuing medical education (CME), or continuing professional development (CPD). The history of PME as first conceived internationally has been well described. The development of PME started rather erratically at the beginning of the 20th century. Professor W. Osler first recognized the need for continuing education in medicine at a lecture he delivered to graduating students at McGill University in 1905 when he said: “the hardest conviction to get into the mind of a beginner is that the education upon which he is engaged is not a College Course, not a Medical Couse, but a Life Course, for which the work of a few years under teachers is but a preparation." Osler later became the Chairman of the Postgraduate Medical Association, an association set up in 1911 to promote postgraduate medical education in the UK. Before then a series of Acts had suggested the need for continuing medical education, in particular the General Council of Medical Education (GCME), which was passed in 1858. In 1886, the GCME promulgated an act stipulating that applicants to it must have “passed a qualifying examination sufficiently to guarantee the possession of the knowledge and skills required for the efficient practice of medicine, surgery and midwifery." In 1921, the report of a committee (the Althone Committee) recommended that a University Medical School devoted to PME should be established. This report gave birth to the Hammersmith Postgraduate Medical School established in 1935, and the British Postgraduate Medical Federation in 1945. The Christ Church Conference held in 1961 under the chairmanship of Sir Richard Pickering, Regius Professor of Medicine at Oxford University gave rise to multiple academic activities and the building of partnerships that eventually led to the establishment of clinical postgraduate training in various UK hospitals, the development of residency training programs and the founding of the Royal Postgraduate Colleges. The UK Medical Act of 1956 began the mandatory one year training for House officers. The progression to Senior House Officers, Registrar, and then Senior Registrar started many years later. Since then, many reforms have taken place in postgraduate clinical training in various disciplines. After 2005, the Modernising Medical Careers (MMC) Reform program came into effect in the specialty of obstetrics and gynaecology. The House Officer and first year Senior House Officer Posts were replaced with a compulsory two-year foundational learning. This is now followed by a competitive entry into a formal specialty-based training. The Registrar and Senior Registrar posts were merged in 1995 as Specialist Registrar grade often entered after a longer period as Senior House Officer. Following the MMC, the Specialist Registrar has been replaced with Specialist Training Registrars who may be in the position for periods of up to 8 years. Thus, under MMC, the career path in obstetrics and gynaecology in the UK now includes a lengthy period of 9 years divided into three stages [Figure 1]. Stage 1 consists of Foundational training of 2 years, which often includes a training module on women's health. Stage 2 comprises the core training, divided into (1) basic training of 2 years, (2) intermediate training of 3 years, and (3) advanced training of 2 years. MRCOG Part 2 is now taken at the end of the intermediate training while the advanced training period largely consists post-MRCOG advanced training in skills development and sub-specialty training. From the above, it is evident that the UK training in obstetrics and gynaecology and perhaps in other clinical disciplines are intensely structured and formalized. They are academically oriented and are often affiliated to supporting Universities, which make their research training more intense. Moreover, the number of years in formal training has increased while emphasis is placed on skills acquisition, mentorship, sub-specialty training, and research. However, there is still a tendency to separate clinical postgraduate training from postgraduate training in the basic sciences or public health. Often, doctors wishing to undertake these forms of training have to seek admissions into structured Masters and PhD programs administered by Academic Departments in Universities. The lack of integration of PME in Teaching Hospitals and those in Universities is still a challenge even in developed countries. Medical education began in Nigeria between 1947 and 1952 when the University of Ibadan started training doctors under a special relationship with the University of London. The University College Hospital Ibadan opened its doors to teaching staff and students in 1957, while the relationship between the University of Ibadan and the University of London was terminated in 1962. It is, therefore, not surprising that PME started rather late in Nigeria in 1973, with the formation of the West African College of Surgeons in 1973. Before then, Nigerian doctors seeking PME either went to the USA, UK, or other European countries. Some returned home when the exchange rates between the Naira and international currencies were still in favor of Nigeria at the time. However, a large number remained in those countries and never returned home. It was an attempt to reverse this inordinate brain drain of high profile medical personnel that led patriotic Nigerians to begin the establishment of PME in Nigeria. Mention must be made of such Nigerians that founded and grounded PME in Nigeria during the formative years. These include our honouree today, Professor Linus Ajabor and others such as Professor E. Latunde Odeku, Professor TA Lambo, Professor WV Fowler, Dr DJO Foulkes-Crabbe, Professor FO Dosekun, Dr TE Dada, Dr Bayo Banjo, Dr O Olowu, Dr TO Bada, Dr BS Afenifuja, Professor J Olu Mabayoje, Professor BK Adadevoh, Professor MA Bankole, Dr EO Odunjo, Prof TAI Grillo, Professor GO Onuaguluchi, Professor EA Elebute, Professor A Akinkugbe, Professor V Aimakhu, Professor OA Ladipo, Professor Wole Akande, and Professor Adeleye among several others. It is, therefore, not surprising that PME in Nigeria was started by Nigerians who studied abroad and returned home with a passion to replicate what they saw in the individual countries where they studied. Thus, PME was fashioned after the UK model where most returning Nigerian specialists had studied, but with slashes of American and Canadian models as well. Thus, PME can be described as an amalgam of UK, American and Canadian postgraduate training models characterised in ways to suit our prevailing medical situation. Two postgraduate Medical Training programmes present exist in Nigeria – the West African Postgraduate Medical College and the Nigerian Postgraduate Medical College. The need for postgraduate medical education programme in Nigeria was first recognised when the Medical and Dental Practitioners Act was passed and the Nigeria Medical Council was established in 1963. Examining boards were immediately established for the specialities of Medicine, Surgery, Obstetrics and Gynaecology, Paediatrics and Public Health by the NMC to draw up curricular and postgraduate training and examinations in the relevant disciplines. A delegation led by Professor J. Olu Mabayoje, then Registrar of the NMC visited several European countries and hospitals to fine-tune their recommendations on ways to establish a viable postgraduate training programme in Nigeria. The proposals of Examining Boards in various specialties were approved by the NMC and given legal backing by Decree No. 44 of 1969. In 1970, the NMC (postgraduate examinations) published its syllabuses and regulations in various disciplines. In February 1970, the NMC informed all States' Ministries of Health in the country about these postgraduate training programmes and advocated for their uptake throughout the country. Some of the advantages of the training program advanced by the NMC at the time included: (1) reduction in cost of training; (2) training in local environment would enable trainees provided much needed clinical services at the same time; and (3) reduction in level of brain drain of essential professionals. The template for the training then consisted of Primary Examinations, Part 1 Examination, and the Part II Final Examinations. The first Primary Examination (then called Basic Science Examination) took place in May 1972. Of the 29 candidates presented, 15 passed; while in in November 1973, of the 12 candidates who attended, 3 passed. External examiners were invited from Oxford, Dundee, and Makerere to take part in these examinations at the time. As for the Part 1 examination, the first examination in internal medicine was held in November 1973, with one candidate being successful out of five. One external examiner came from the Royal College of Physicians (UK), while another was invited from the University of Ghana Medical School. The external examiners reported that the standards were fair and that the successful candidate would most likely have passed the UK MRCP examination. In the first Part I FMCOG examination, one candidate was successful out of four, and the external examiners also wrote favorable reports about the high standards of the examination. Later, Part I examinations followed in Surgery and Paediatrics in January 1974. Of three candidates that took the examination in Surgery, two passed, while the only candidate in Paediatrics was successful. Transition to the National Post-graduate Medical College (NPMC): Thus, it can be said that PME in Nigeria started under the tutelage of the NMC, but a more formal setting was needed to firmly entrench its practice. At its Annual General Meeting of the Nigerian Medical Association in 1971, a motion to set up a separate body to conduct postgraduate training and examinations in Nigeria was moved by Professor Adeyemo Elebute. This led to the formation of the National Medical College as the first medical postgraduate education nomenclature in Nigeria. The first office of the National Medical College was within the office of the Nigerian Medical Council in Alaka, Lagos, but this was later moved to the College of Medicine of the University of Lagos in Idi-Araba, Lagos. The Registrar of the Nigerian Medical Council continued to be the Secretary and Chief Administrative Officer of the National Medical College. The first person to hold the position of Secretary of the National Medical College after its separation from the Nigerian Medical Council was Professor NE Henshaw. The Decree establishing the National Postgraduate Medical College was signed into law by General Olusegun Obasanjo on September 24, 1979. The Decree provided for the establishment of (1) 13 Faculties, each with a Faculty Board and Faculty Board of Examiners; (2) a Senate that supervises academic programmes; and (3) a Governing Board that oversees the financial, administrative and management policies of the College. President Shehu Shagari formally inaugurated the College on February 19, 1984. The mandate of the NPMC is “to plan, implement, monitor and evaluate postgraduate programmes required to produce medical and dental specialists of the highest quality, competence and dedication, who will provide teaching and optimal health care for the people. Lifelong learning is expected to be maintained by continuing professional development programmes of the College." The vision of the College is “to produce medical and dental specialists of the highest standards who will provide world class services in teaching, research and healthcare." The Association of Surgeons of West Africa was formed in 1960, with the objective to promote postgraduate education and research in surgery and related disciplines throughout West Africa. The Association of Physicians of West Africa comprising Gambia, Sierra Leone, Ghana and Nigeria was formed in 1963 with similar objectives to promote learning and research among physicians in the specialties of internal medicine, paediatrics, psychiatry, pathology and community health. A Committee was later constituted under the aegis of the Commonwealth Secretariat to harmonize the two Associations, a move that later gave birth to the West African Postgraduate Medical College (WAPMC) in 1976. Till date, the WAPMC comprises two composite Colleges – the West African College of Surgeons and the West African College of Physicians. The WAPMC has designed its academic and examination programs based largely on the programme of the Nigerian Postgraduate Medical College, but influenced heavily by the UK programmes in related disciplines. The Colleges commenced their examinations in 1979, with the specific objectives “to: 1) advance professional education and training in all medical, pharmaceutical and Nursing disciplines; and 2) promote and achieve a high standard of professional practice and competence among practitioners." However, most of the infrastructure, including trainees and training Faculties of the WAPMC, have resided and have emanated from Nigeria. This has from time to time led to the argument that this is a duplication of effort to have two medical postgraduate training institutions running parallel programs in the country. However, the regional focus of the WAPMC has tended to give it more international recognition and acceptability, especially as it allows for cross-country exchange of medical specialists across West Africa. The pattern of residency training in Nigeria has not changed since it first debuted in the late 1970s and early 1980s. Both Programs – the NPMC and WAPMC – adopt the same methodology, consisting of hospital-based residency followed by examinations at periodic intervals. 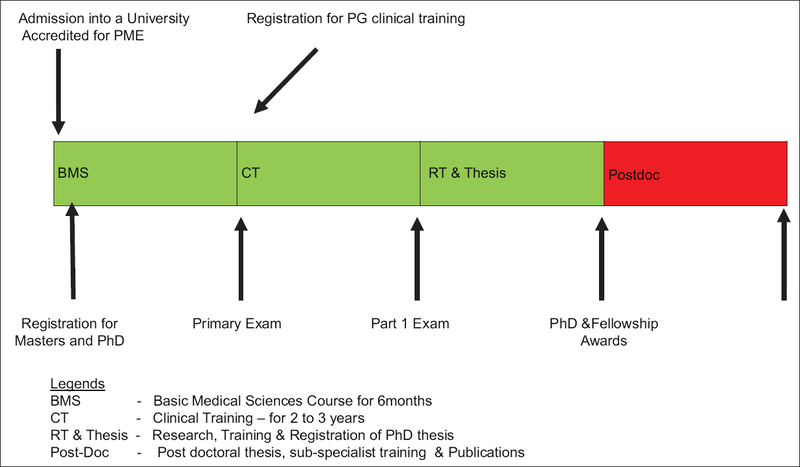 A summary of the career path in both training programmes in obstetrics and gynecology is presented in [Figure 1] and [Figure 2]. The primary examination is the first entry point in both Colleges, with applicants being medical graduates completing their National Youth Service Corp. No formal teaching or structured courses are featured for this examination by any of the Colleges. In contrast, candidates are expected to prepare for the examinations in their spare time, but some Specialities and Colleges sometimes organize revision courses to prepare candidates for the primary examinations. The primary examination consists largely of basic medical sciences in related disciplines, and this being the very foundation of any speciality, it is sad that the Colleges have not taken this stage of the examination seriously in terms of actual preparation of candidates. A pass in the primary examination of either the NPMC or WAPMC is now a prerequisite for admission into residency training in hospitals approved for training throughout the country. The entry point is usually as Senior House Officers or Junior Resident. In most hospitals, residents are expected to provide clinical services as core part of their training, with structured training almost non-existent or provided merely as an after-thought. Many hospitals do not have structured training programs or lecture schedules or seminars through which the residents are to consolidate their skills and knowledge. In attempts to correct this anomaly, both Colleges provide guidelines for training that includes structured rotations through clinical specialities and sub-specialties. These rotations in addition to submission of a book of cases (in the case of the FMCOG) are required before candidates are allowed to proceed to the Part I examination. Periods ranging between two to three years clinical training are normally required before candidates can take the Part I FMCOG examination. Candidates who pass the Part I examination are then promoted to the post of Senior Registrars (or Senior Resident) – and this could be attained within 2 years of entry into a programme. Further progression is less structured, as the candidate is then merely required to provide a book of clinical cases (as with the WAPMC) or to conduct research and write a thesis on a subspeciality topic (as with the NPMC) before they can be eligible for the Part II examination. This period requires a mandatory clinical exposure and maturity of up to two years, during which the candidate also supervises the clinical duties of junior residents and medical students (for those enrolled in medical schools). Upon passing the Part II (Final) examinations, candidates are now immediately appointed Consultants in Teaching and Specialist Hospitals where appropriate vacancies exist. [Table 1] presents the candidates admitted into Fellowships in 14 Faculties of the National Postgraduate Medical College from its onset up to 2009. A total of 2514 Fellows were admitted by examinations during the period. This figure must have grown to nearly 3,500 between 2009 and 2015 considering the fact that during the 2015 Convocation Ceremony of the College about 300 new Fellows were added to the list. In addition, the number of Faculties in the College has risen to 15, which further adds impetus to the number of trainees that the College can produce. If the contribution of the WAPMC is added to this, and both Colleges seem to be at par in the enrolment and production of graduates, the number of specialists produced by both Colleges will be hitting the 7000 mark. This no doubt is a major contribution to PME and the production of human resources for health in Nigeria. As expected, specialist obstetricians and gynaecologists are in the majority, followed by internal medicine (physicians) and then surgery (surgeons). Thus, a major strength of the postgraduate medical training in Nigeria is its correction of the human resource deficiency that the country suffered in the 1970s and 1980s. Before then, many Nigerian specialists who trained abroad never returned home, leaving huge gaps in key specialist areas. Specialists such as anesthetists, radiologists, ophthalmologists, and pathologists were in very short supply, and among the few that existed they preferred to remain in big hospitals in urban cities while rural and sub-urban areas remained largely under-served. Now all that is fast disappearing. With the reasonably high supply of all categories of specialists, even district hospitals in most remote areas are benefitting from this largesse of specialists. With in-country training, the cost of PME declined, with resulting salutary effects on the national economy. Indeed, the nature of the cost-effectiveness of the training programme to the national economy needs to be systematically investigated to provide greater impetus for the promotion of postgraduate training within the country. Moreover, local training enabled trainees to study the nature and pattern of highly prevalent disease conditions, such that diseases that were previously poorly investigated now feature regularly in research results and interventions in the country. Indeed, the systematic decline in the prevalence and reduction in the case-fatality of many local diseases in recent times can partly be attributed to better understanding of their epidemiology and new treatment regimens, propelled largely by repeated provision of evidence-based data provided by trainees and participants in postgraduate training programmes in the country. The quality of postgraduate training in Nigeria has also reasonably been optimal. Especially during the earlier years of its establishment, there was no doubt that the quality of graduates in the programmes compared reasonably well with those from other parts of the world. It was for this reason that a program such as the FMCOG had reciprocity for part of its examinations with the Membership Examination of the Royal College of Obstetricians and Gynaecologists at the time. Post-graduate doctors who completed Primary Examinations of the FMCOG and the FWACS were exempted from the Part 1 MRCOG. Indeed, I was a beneficiary of this practice at the time! Additionally, reports indicated that candidates who completed their Part I examinations and were admitted into UK hospitals under the “Double Scholarship Scheme” performed excellently well, although many of such candidates have remained in the UK since then till now. The fact that two Nigerians who trained solely under the Nigerian postgraduate program were recently awarded Honorary FRCOG (ed aundem) (Professor Ekele and my humble self) by the Royal College of Obstetricians and Gynaecologists further testify to the quality and international acceptability of the Nigerian national training programs. Unfortunately, things have not always remained the same. There is evidence that the Nigerian and West African postgraduate training programs have not managed to sustain the reputation for quality and excellence that was achieved in earlier years. Not only has the “Double Sponsorship Scheme” been abated, there are reports indicating that the quality of clinical performance of specialists who trained primarily under the Nigerian program working in UK hospitals have declined over the years. In addition, the poor attention paid to training of resident doctors in research has led to the debate of its relevance vis-à-vis PhDs and higher degrees offered by Nigerian Universities. The elements of this debate will be discussed later in this presentation. Furthermore, the almost nonparticipation of international trainees and trainers in the Nigerian training programs may be due to the fact that none of the Colleges or programs has yet been accredited by regional or international accreditation bodies. Poor funding. Although the National and West African Postgraduate Medical Colleges are parastatals of government, there is almost no dedicated budget for actual postgraduate training. Budgets provided are normally inclusive of salaries and overheads, but not much is dedicated to actual program implementation, teaching, and research related to medical postgraduate training. The Tertiary Education Trust Fund (TETFUND) that provides funding for tertiary education in Nigeria does not include medical postgraduate training in their resource allocation, citing the noninclusion of medical education in the law that established the Fund as reason for the exclusion. Teaching and tertiary hospitals under which PME is accommodated are funded by the Federal and State Ministries of Health or private proprietors, but often do not receive dedicated funding for postgraduate training. Thus, postgraduate training in Nigeria is almost left as an ad hoc or passive service without the financial support to enable it gain the needed momentum. Indeed, it is my strongly held opinion that the recent call for the privatisation of teaching and tertiary hospitals will further de-activate PME in Nigeria. Informal status of PME in teaching hospitals. Unfortunately, the teaching hospitals in which PME are housed pay little or no attention to postgraduate training. Residents are treated as laborers and part-time workers, who are considered only for clinical services they provide rather than agents to be trained to enhance improved work outputs. Some hospitals field offices such as “Directors of Postgraduate Training,” but the offices largely exist to curtail demands and excesses of resident doctors rather than to systematically support various elements in post-graduate training. Indeed, many hospitals do not have structured curricular for the training of residents. There are no didactic teaching schedules, while supervising Consultants are often too busy to conduct teaching rounds that are the time-honoured methods of training undergraduate and post-graduate students. And residents themselves are also too busy engaging in “extra-mural private practice” or planning the next round of strikes (lock-outs) to take their postgraduate training seriously. Surely, there are lots to be written about the inadequacy and unpreparedness of teaching and tertiary hospitals to support post-graduate medical training in Nigeria. Many hospitals do not have dedicated seminar rooms, reading rooms, libraries or furnished offices for residents in training. The postgraduate learning environment is often not available in many hospitals, and support for research is non-existent. The structure of the present post-graduate medical training has weakened over the years, and would need to be rebuilt if PME in Nigeria is to rise to the next level of development. The noninvolvement of Universities in PME is a major problem. Universities have traditionally provided undergraduate medical education in Nigeria. Teaching hospitals were set up to provide clinical training to support the basic training offered by Universities, and it was never intended that they would provide content training alone. Thus, the fact that PME is located solely within teaching hospitals without the inputs of universities is an anomaly. This is further accentuated by the recognition that teaching hospitals and Universities are governed by two separate arms of government (Ministries of Education and Health), and results in PME located within Teaching Hospitals not benefitting from the involvement of Universities. Involving Universities in PME is crucial in three ways. First, Universities have the required infrastructure for post-graduate training which would be useful for PME. Several Nigerian Universities have Schools of Postgraduate Studies with considerable experience in curriculum design and implementation in various fields of studies. Such a school can remove the burden of curricular planning, monitoring and review that Teaching Hospitals involved in PME have no experience to implement. Second, the fact that Universities often feature several disciplines means that their involvement in PME will enable medical doctors involved in PME to gain experience and exposure to other fields such as pedagogy, sociology and anthropology, statistics, public administration and law. Indeed, it is important that PME benefits from a multi-disciplinary approach since fellows trained under the programme are increasingly playing multiple roles not only in the country's health sector, but in other fields of development as well. Finally, the involvement of Universities in PME will allow for internationalization of the training programmes as Universities provide the bedrock for postgraduate training in other parts of the world. Inadequate research component. PME is presently characterized by inadequate research training and low research outputs by its participants. Not only do participants not receive didactic or practical exposure in proposal writing, research methods, research design, biostatistics, computer-based learning, and writing methodology, the actual outputs in terms of high quality publications that meet international standards are also limited. Although the development of a dissertation is one requirement for obtaining some of the fellowships, often the dissertations often are not purposefully designed, often depend on repetitive or retrospective data, and are not rigorous enough to enable publication in high ranking international journals. This is a challenge that needs to be overcome in efforts to improve the quality of PME in Nigeria. Poor monitoring and evaluation of training programs and graduates. A major challenge facing PME in Nigeria is the lack of effective monitoring and assessment of trainees and trainers of the program. Some of the most innovative methods in teaching methodology include the integration of methods that assesses not only the students but also where students have the possibility to assess their teachers. To date, there are no known methods designed by the NPMC and the WAPMC to monitor the performance of the graduates from the programs, neither do they have an approach for assessing the teachers, trainers and even health institutions participating in the programs. Without such a system, it would be impossible for the training programs to do things differently in ways to consolidate their quality and attain regional and global relevance. Nonreview of training curricular. Part of the weakness of PME in Nigeria includes the lack of review of training curricular by relevant Faculties. Although a lot of changes have taken place in PME internationally and in medical knowledge and skills in particular, not many changes have taken place in training curricular in this country over the last couple of years. Some attempts at revision of curricular have taken place, but this has not been radical or deep-seated enough to change the pattern of training or the orientation, knowledge and skills of trainees. Right from the beginning of the program, it has been “business as usual", with new trainers being recruited who may not have had the required skills and knowledge to participate in training and in examinations. In particular, the training remain focussed on passing examinations without substantive efforts made to purposefully train the candidates to address the peculiar health challenges in the region. The lack of internationalisation of the local PME programs is a major challenge. To date, many of the fellowship degrees offered under the NMPC and the WAPMC have not been accredited by international accreditation bodies, and this is an important challenge that needs to be addressed if our healthcare delivery system is to attain global standards. Nigeria's health care system is presently ranked by the World Health Organization as one of the weakest (187/192) in the world, in part due to the low quality of its health services provision, propelled largely by specialists and consultants. If the country's PME were to attain global stage in terms of its quality and propensity to adopt internationally accepted evidence-based standards and methodologies, it is possible that this will not only improve the health system, but will also enable the country to attain high global ranking in the provision of quality health services. Achieving global standards and internationalising postgraduate medical training must be one bench-mark that Nigeria's PME must focus on in the immediate future. The PhD versus Fellowship controversy started in 2008 when the National Universities Commission (NUC) made it mandatory that all teachers in the University system must have a PhD in order to progress in the Nigerian University system. Before then, the same NUC working in collaboration with the NPMC and the WAPMC, and in view of the peculiar nature of the training of clinical teachers, had established that Fellowship degrees are equivalent to PhDs for the purpose of career progression in the Nigerian University system. Indeed, throughout the world, especially because postgraduate clinical training embraces the same number of years of training as PhD and may even be more intensive, fellowships are accepted for entry into the University system. There has never been such a controversy in other countries; why it exists in Nigeria is still not completely clear. The controversy became more intense when attempts were made by some Universities to make it mandatory for applicants to the post of Vice-Chancellors to possess PhD degrees. This was extremely bizarre as it meant that although a person may have risen to the post of Professor in a clinical discipline and has obtained vast experience in University administration, but because he has not previously obtained a PhD, he may not rise to the highest position in the University system. This seemed a major inequity and unfairness, which many clinical teachers justifiably rose up to challenge. Today, it is well known that there are several nonclinical, nonPhD holders who have risen to the post of Vice-Chancellors, and there have equally been several clinical Fellows, non-PhD holders who have done well as Vice-Chancellors in the Nigerian University system. Thus, it is becoming increasingly evident that the effectiveness of a Vice-Chancellor does not depend on his possession of a PhD, and so this cannot be as an argument for prioritising PhDs over clinical postgraduate training for headship of Nigerian Universities. The real issue seems to be whether Fellowships are as rigorous as PhDs to implement high quality research and supervise undergraduate and postgraduate students and junior faculties in the implementation of research, which is a major function of Universities. In many parts of the world, evidence has shown that Fellows are as good as PhD holders in the implementation and supervision of research. However, for the Nigerian system, one way to counter this element of the controversy is to strengthen the research training component of the fellowship training programs. A counter argument has been that even the quality of PhD training has also weakened in all disciplines in Nigeria due to inadequate facilities for research. So, no one should throw the first stone as there is a need to strengthen both fellowships and PhD training in all disciplines in the country. One way to resolve this controversy is to integrate Fellowship training with PhD training. In many developed countries, many Fellows also have PhDs, which indeed puts such “double-barrel graduates” ahead of those who possess PhDs or Fellowship degrees alone. Such a solution is possible in Nigeria, and can easily be infused into the current postgraduate training program in the country. Postgraduate Medical Education in Nigeria would need to be extensively reviewed to enable it gain momentum to overcome some of the challenges listed above, and to deepen research and training in the medical sciences in the country. The present administration of President Muhammed Buhari would do well by constituting a high level committee to undertake this review within the shortest possible period of time. The NPMC might for example need to be upgraded to a University for Postgraduate Medical Education that would incorporate the principles of didactic learning and structured administration that are normative of University systems. Alternatively, a different approach that integrates the current system of hospital-based training to Universities that offer undergraduate medical education might be developed to strengthen the academic and multi-disciplinary learning components of PME. Increased funding of PME is crucial if the proposed benchmarks for gaining excellence and quality are to be attained. Increased funding of the NPMC and the WAPMC as presently constituted either by adequate federal budgetary allocations or through revision of the TETFUND law to enable the organization to also target postgraduate medical education for funding would be of great importance. It is instructive that while TETFUND funds students to undertake postgraduate medical training abroad, it does not fund the local postgraduate medical training programs within the country. This is an anomaly and an ambiguity that needs to be revised and corrected. There is also a need to extensively review all curricular for PME to enable them meet international accreditation standards. International accreditation agencies and similar postgraduate training institutions in other parts of the world should be engaged to participate in the curriculum review process. Training of trainers and examiners in PME is also now sorely needed. In particular, PME trainers should be trained and re-trained to use standard teaching and pedagogy methods, including ICT. Their capacity to mentor trainees should also be actively developed. Additionally, present examination procedures need to be overhauled in both Colleges to include the assessment of candidates in relevant knowledge and skills that promote the uptake of the most recent interventions in health care. In particular, examination methods should be structured to elicit the ability of candidates to be innovative and inquisitive, and must include the assessment of research results. Such research must be novel or nearly novel, must be purposefully designed, and must rely on use of research methods that were led or nearly led by the candidates. One of the revisions that ought to be made to PME in Nigeria is to make it possible for candidates to obtain both the Fellowship as well as the PhD degrees before they complete their training. One way to do this is first to ensure that entrance into PME is through a formal admission process into a University designated for the purpose. That means that all present Teaching Hospitals accredited for postgraduate training should be linked to Universities that offer undergraduate courses in Medicine. Candidates so admitted into PME will undergo six months to one year pre-clinical training in basic sciences, including research methods, public health, biostatistics and ICT, after which they will take the first examination (presently called Primary Examination). Those who pass the Primary Examination will then be admitted into the clinical training (intermediate) part of the program. This will include building the advanced knowledge and skills of candidates in critical clinical care, while at the same time training them to be critical and skilled in using the research principles and skills they learned in their pre-clinical basic sciences training to develop research in the clinical disciplines. The intermediate training should normally not last more than 2-3 years, following which candidates will undertake the Part 1 Clinical examination. Those who pass the Part 1 examination will then progress to the Part II and final part of the training. Part II training will focus on defence and implementation of a research proposal with submission of a thesis (as done for PhDs) in the discipline or in a related discipline. The supervisors would include both a clinical specialist, but also someone with a PhD working in a related discipline. The idea is that once the candidate is adjudged as passing the PhD thesis, he/she will be exempted from the Fellowship examination and will be immediately be awarded the Fellowship degree. Thus, final outputs will be both PhD and fellowship degrees for entrants into such a program. A major feature of this pattern of training will be for the candidate to registered for an MSc or/and PhD degrees training at some point during their entrance into the program, and to pursue them simultaneously. [Figure 3] illustrates the suggested template for this integration. Going forward, monitoring, objective assessment and evaluation should feature prominently in the implementation of PME in the country. Thus, properly designed Monitoring and Evaluation frameworks should be developed along with process and outcome indicators. Reports on the agreed indicators should be provided periodically both at the institutional as well as national level as ways to measure the quality of implementation and level of success of the programs. This will allow adequate corrective measures to be put in place, and therefore allow the systemic growth and development of PME in Nigeria. There can be no doubt that PME has gained considerable momentum and ascendancy in Nigeria. However, the quality of its development has not matched the enthusiasm with which it was begun several years ago. This lecture is a befitting tribute to our hero, mentor and benefactor, who with several of his colleagues championed the development and implementation of PME in Nigeria in the 1970s. The assessment undertaken in this paper suggests that while the main purposes of PME have largely been achieved in Nigeria, a lot remains to be done in propelling it beyond its original vision to enable it compare favourably with similar medical postgraduate training programs in other parts of the world. One of the greatest attributes and respects that can be paid to national icons and visionaries like Professor Linus Ajabor is to ensure that the program which they so elegantly conceived and implemented in the earlier days, grow from strength to strength and exceed their expectations and projections in terms of the quality of its outputs and impact. This lecture is therefore a call for action for all stakeholders to do everything possible and with great determination and commitment to propel the fortunes of postgraduate medical training in Nigeria. Lister J. The history of postgraduate medical education. Postgraduate Med J 1994;70:728-31. Osler W. The student life. Valedictory address to students at McGill University, April 1905. In: Selected Writings by Sir Osler. Oxford University Press: Oxford; 1951. Althone Report. Report of the postgraduate Medical Committee (Athlone report). GMPO, London; 1821. Danmole HP, Adeniji A. A history of National Postgraduate Medical College of Nigeria, 1979–2009 (Ist Edition). NPMC, 2011, Ijanikin, Lagos. ISBN 978-2283-39-8.